Jenna Hipp is my girl! Celebrity nail stylist and known for her "green" approach, Jenna made a commitment to using only earth friendly products on each and every hand. Her celebrity clients include Amy Adams, Miley Cirus, Jessica Alba among others and her work has appeared in countless magazines. Covers such as Harper's Bazaar, ELLE, Nylon, Vogue and Jenna has quite an abundant following on the Social Media circuits as well. 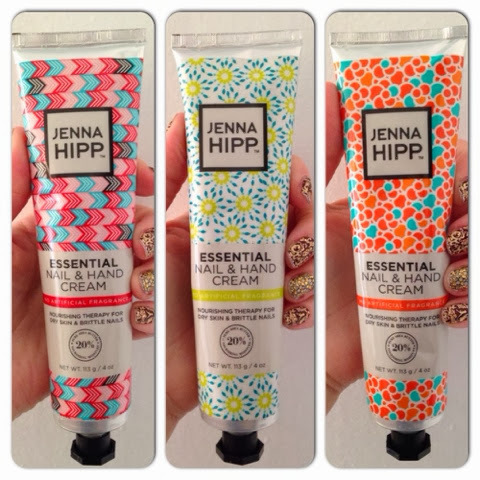 This summer Jenna launched a full nail collection along with these Essntial Nail & Hand Cream Collection ( $ 19.99) at select Costco stores nationwide as well as www.Costo.com. Formulated with 20% pure Shea butter, these nourishing creams as as a form of therapy for dry hands and brittle nails. They instantly add moisture and allow hands to look and feel more healthy.